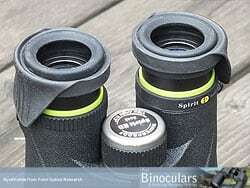 When I reviewed the Steiner 10x42 SkyHawk Pro Binoculars one of my favorite features was that they had rubber side flaps on the eyecups. They were very simple, but really helped to block out light from the sides of your face and definitely improved the overall view through the binoculars. It is interesting that such a small thing can make such a big difference which is why it is so strange that apart from some Steiner models and the Nikon EDG Binoculars, it is not a feature that you see on many binoculars. I am not sure why, but it is a shame. When not needed, you can easily flip the EyeShields down, where they will not interfere with eyepiece covers, carry cases, etc. To fit them to your binoculars, all you have to do is stretch the rubber loop over the eyecup of your binoculars... that's it! This is really simple for the most part, but was a little more tricky to get them positioned exactly right on my Vanguard 8x42 Spirit ED Binoculars that have a very soft grippy rubber eyecup, but once fitted, they are really secure and wont move out of place or come away very easily. They will fit most binoculars, including most of the major brands and come in two sizes (standard and compact). 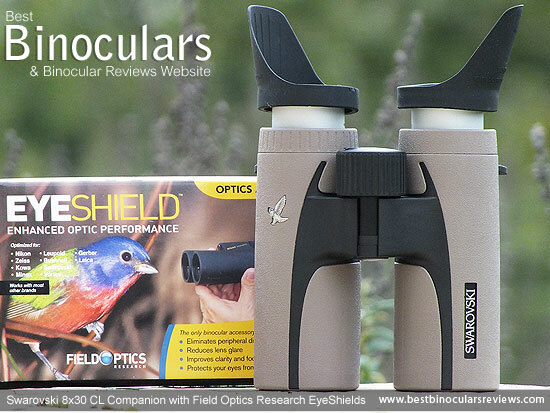 The standard EyeShields will fit binoculars with an eye cup of 1.45in to 1.75in. The compact EyeShields will fit eyecups with a diameter of between 1.1in to 1.46in. 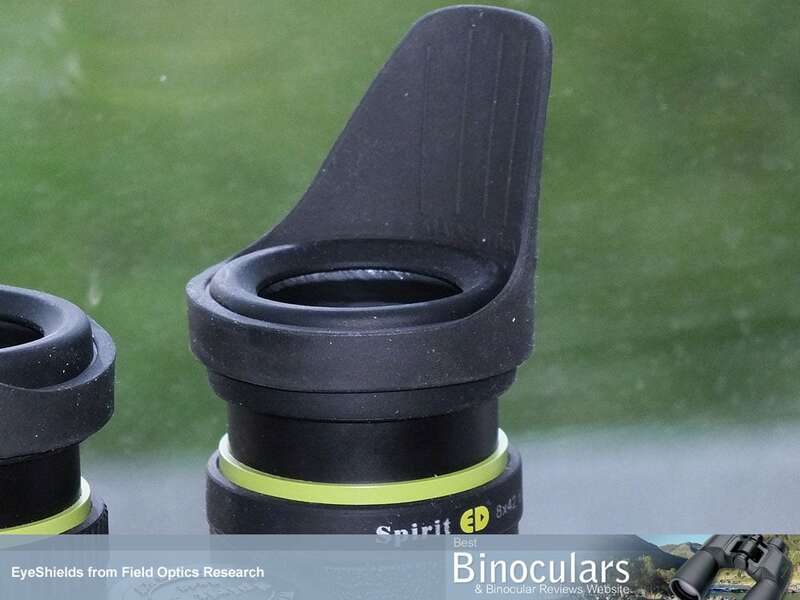 For most Swarovski binos, standard EyeShields fit perfectly right behind/under the eyepiece when the eyepiece is extended. This way it won't interfere with eyepiece dust covers. Fold the EyeShields down to stow. 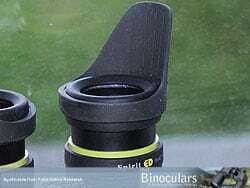 For most other binoculars EyeShields fit right onto the eyepiece, with about 1/8 inch or so of the eyepiece left exposed. For more on this take a look at my article on Eyeshields on the Swarovski 8x30 CL Companion. I found that rather like a horses blinkers (blinders in the US), as they block out any peripheral view from the sides that can sometime be distracting - now 100% of your focus and attention is on the target that you are looking at through your optics. Any light and glare from the sides is eliminated, which really helps to improve the view. The best way to describe the difference is exactly as Field Optics Research say in their marketing: It is like turning off the lights to watch a movie - the image just seems to jump out at you more because everywhere else is dark. Their marketing also mentions that their EyeShields will also block out wind, dust, rain or snow, which is true although to be honest, apart from wind, these have never really been a problem for me. Perhaps if you often use your binoculars in extreme weather or use binoculars when skiing (see my guide to skiing binoculars) then they will be really useful in these situations. I like the fact that once fitted you can just keep them on your binoculars. Even if you don't need them, you can just fold the side flap back on itself to leave you with just the standard eyecups. This is great because if I had to remove them every time I did not want to use them, I would eventually end up losing one or both, forget to bring them with me or just not bother to put them on. In fact the most dramatic way to see the difference they make is to first fold them down and out of the way, then put binoculars up to your face, then flip them back into place. The difference is then instantly noticeable. 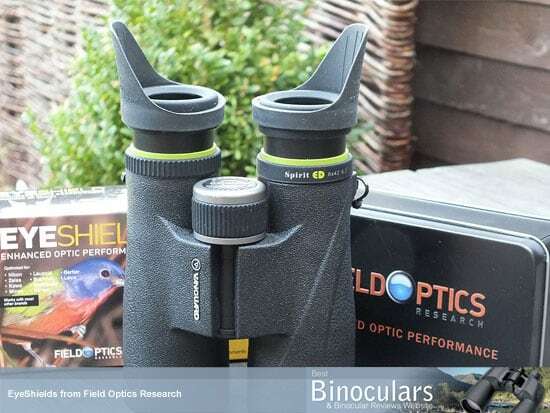 As a testament to how much Field Optics Research believe in their product, they offer a lifetime guarantee against damage or even Loss Policy. So if your EyeShield(s) are damaged or even lost, they will replace it for free. All you have to pay is a $4.95 shipping and handling fee, which I am sure you will agrees is pretty impressive. Overall I really like the EyeShields and yes, they really do make a difference to the view by blocking out glare and ambient light, especially on bright sunny days and when the light is coming at you from the side. Whilst they are a very simple product, they look to be very well made and should last a long time and a nice touch is the really good quality tin box that they come in. So for their price, I do think they make good value for money and are definitely something that I will be keeping attached to favorite pair of binoculars. As far as I have seen these Field Optics Research Eye shields are only currently available in the US. I would like to thank the guys at Field Optics Research for sending me some sample EyeShields to review. I would also like to point out that all the reviews on this site, including this one are my opinion and are not influenced in any way by manufacturers, distributors or suppliers. Reviewed by Jason Whitehead at BBR.